Nation of Islam Minister Louis Farrakhan speaks during the Rally for Justice and Unity on Friday at the Lake Michigan College Mendel Center in Benton Township. Farrakhan said Benton Harbor has a crying need for better education. BENTON TOWNSHIP - Nation of Islam leader Louis Farrakhan told hundreds of people Friday night that they live in a world that deprives most human beings of their human rights, and nowhere is that more evident than in Benton Harbor and cities like it. Speaking at the Lake Michigan College Mendel Center to about 400 people, Farrakhan said the mostly black city has a crying need for better education, which he said is a human right. "A man who gives you inferior knowledge can dominate you. The only way to keep us as a tool is to keep us ignorant. Some of us don't even know that we are tools," Farrakhan said. He is the Supreme Minister and National Representative of the Nation of Islam and Elijah Muhammad. He is an advocate for African-American interests and often a critic of American society. The 76-year-old minister lives part time in Kenwood, a neighborhood on the south side of Chicago, and part time at a Nation of Islam farm in New Buffalo. Farrakhan is recognized by some as a speaker with a powerful allure, and by others as a controversial figure. A man who spoke before Farrakhan predicted that the media would "distort his message." Farrakhan brought the crowd to its feet when he told the people to be tools in the tool chest of God. He said that is what Edward Pinkney of Benton Harbor was trying to do. "I am honored to be here at the call of justice," Farrakhan said. "Mrs. Pinkney, my dear suffering sister, I am honored to be here on behalf of your husband." Farrakhan said he was touched by Pinkney's case and came to Benton Harbor to meet and support him. Pinkney also has the support of the American Civil Liberties Union, which is appealing his conviction on a probation violation. Pinkney was on probation last year for a 2007 election fraud conviction involving a Benton Harbor recall election. While on probation, he wrote an article in the People's Tribune, a Chicago newspaper, stating that Berrien County Trial Court Judge Alfred Butzbaugh, who handled the election fraud case, could be punished by God "with consumption and with a fever and with an inflammation and with extreme burning." Another Berrien County Trial Court Judge, Dennis Wiley, ruled that Pinkney's words constituted a threat, which was a violation of his probation terms. Wiley handed Pinkney a 3-10-year prison sentence. Pinkney was released after the Michigan Court of Appeals ordered the Berrien County court to set bond. Pinkney has been out of prison since posting a $10,000 bond late last year but is not allowed to leave his home without permission from the court. For that reason, he could not attend Friday's "Rally for Unity and Justice" organized by Marcus Muhammad, a Benton Harbor resident who is running for election to the City Commission. Also speaking at the rally, besides Farrakhan, were several other ministers and Pinkney's wife, Dorothy. 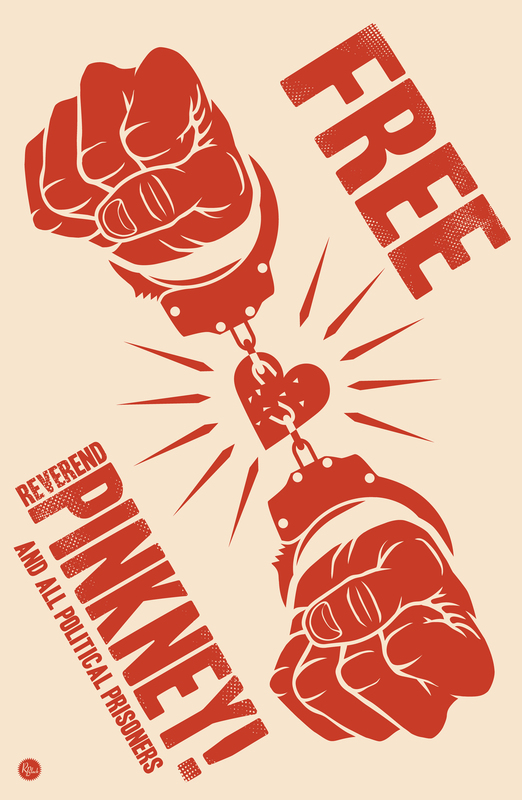 "This is not about Reverend Pinkney. It's bigger than us," she told the crowd. "He used to say 'I'm just trying to matter.' 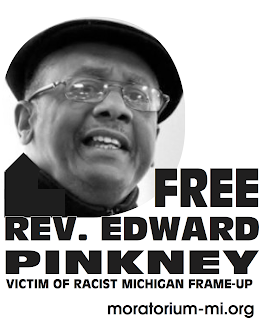 "
Before his arrest, Pinkney spent nearly every day at the Berrien County courthouse, listening to cases and offering free advice to defendants from Benton Harbor. Dorothy Pinkney asked people to support her husband at a hearing Tuesday in Grand Rapids, where the state Court of Appeals will hear oral arguments in his case. Pinkney was arrested on election fraud charges following the 2007 recall of former City Commissioner Glenn Yarbrough, who soon regained his seat when a judge nullified the recall election. Yarbrough was subsequently re-elected, but later resigned. Pinkney and his supporters now say he was targeted for arrest because he was against what they call "a land grab" by Whirlpool Corp. in Benton Harbor. But at the time of the recall election, Pinkney's stated reason on a petition seeking to recall Yarbrough was "for supporting (then) police chief Sam Harris." The alleged "land grab" by Whirlpool is related to the Harbor Shores golf course development, which came about later. jswidwa@TheH-P.com.